Big Mommas: Like Father, Like Son, also known as Big Mommas or Big Momma's House 3, is an American action comedy released in February of 2011. It is the second sequel in the Big Momma's House series of films. 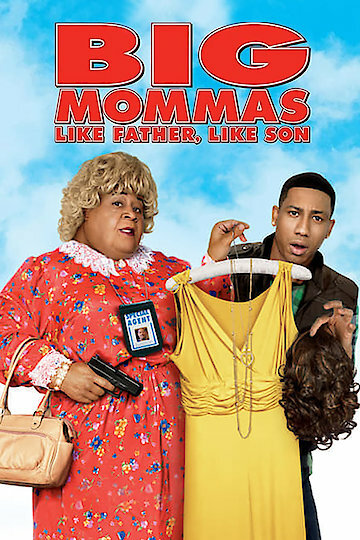 Big Mommas: Like Father, Like Son sees the return of actor Martin Lawrence as FBI agent Malcolm Turner and brings his stepson Trent Pierce, played by Brandon T. Jackson, into the fold. Trent's entry into the world of Turner's alter ego Big Momma starts when he wants his stepfather to sign a recording contract for him rather than go to Duke University. When Turner refuses, Trent is encouraged by his friends to ambush his stepfather on the job and force him to sign the contract. Unfortunately, Trent lands in the middle of a failed bust that leaves one of Turner's informants dead and allows the Russian gang member he's been tracking to escape. Though Turner helps his stepson escape, he realizes Trent's car is still in a place where the Russians will be able to track him down. Deciding to go undercover, Turner returns to his role as Big Momma and gets Trent to dress as Charmaine - Momma's great-niece. Hiding at the Georgia Girls School for the Arts, Turner becomes a house mother while Trent, as Charmaine, enrolls as a student. During their time undercover Trent befriends Haley Robinson (Portia Doubleday), who he begins to fall for while working on a musical number for a student showcase, while Turner investigates a missing music box with security guard Kurtis Kool (Faizon Love). As the movie progresses, both men reveal their true identities to their new friends in order to help them avoid any further trouble from the Russian gangsters. Big Mommas: Like Father, Like Son was directed by John Whitesell and released by 20th Century Fox. Big Mommas: Like Father, Like Son is currently available to watch and stream, buy on demand at Amazon, Vudu, Google Play, FandangoNow, iTunes, YouTube VOD online.